The first batch of Kickstarter backers for the Neptune Pine smartwatch are about to receive their devices. After what feels like years, the Pine, which we thought looked pretty great when it was first revealed, is much more than a dependent watch on your wrist. Unlike Android Wear, it features data connectivity on its own, meaning its basically a condensed smartphone on your wrist. The Pine features a 2.4″ full-color display, Snapdragon S4 processor, 512MB of RAM, 16GB or 32GB of internal storage, 810mAh battery, front-facing camera, rear-facing camera, GPS, micro USB charging slot, and a fully tweaked OS based on Android 4.3+. The Neptune Pine, if you were not an early bird backer, can be pre-ordered for $349 for a 16GB version or $449 for a 32GB version. If pre-ordered, the devices are set to ship in Q4 of this year. Is anyone here one of the backers? Are you still liking the Pine over Google’s Android Wear? MONTREAL – Aug. 6, 2014 – Neptune is excited to announce that the first round of Pine smartwatches have been shipped to Kickstarter backers. After its massive campaign success, with over 2,800 backers and $800,000 pledged, Neptune is thrilled to be delivering a high quality product that combines untethered connectivity and superior design to create a new way of interacting with technology and each other. 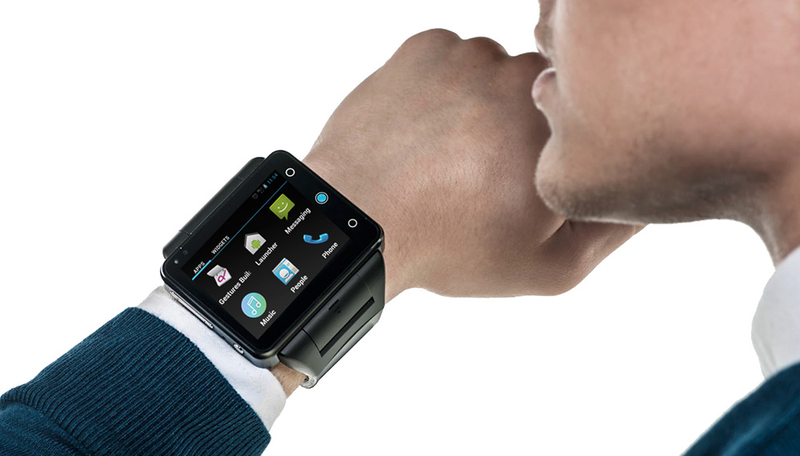 The Neptune Pine is the world’s first independent smartwatch. The Pine allows users to make and receive phone calls and text messages, shoot video and take pictures, check email, browse the web, play music or games, and more – all without the presence of a smartphone. The Pine is also an extremely powerful fitness tracker, with built-in GPS, pedometer, and a compass. When used with an app, it can track steps, pace, time, laps, and calories burned. Additionally, the Pine handset can be attached to mounts or other accessories where it becomes a wearable, point-of-view (POV) video camera, shooting in 720p HD video with its rear-facing 5-megapixel camera. The Pine features a removable, full-color 2.4 inch capacitive touch screen with full QWERTY keyboard for a truly “smart” experience. The Android-supported smartwatch has memory storage of up to 32GB to ensure users can store hundreds of apps, music and photos. The front and rear facing camera with LED flash gives users the freedom to take images from any angle and to video chat easily anytime, anywhere. The second batch of Neptune Pine smartwatches will be delivered to Kickstarter backers by November 2014. Non-Kickstarter backers can also pre-order the Pine for USD$349 for a 16GB version or USD$449 for a 32GB version at getneptune.com. Those orders are set to ship by Q4 2014.